That F'ing Monkey: Flash Friday: Shark Week! Happy Flash Friday everyone! In case it hasn’t been obvious it is it is also Shark Week over at the Discovery Channel. Discovery forgot it was still in the middle of Shark Week and decided to run episodes of Gold Rush all day. If you’re like me and need a steady stream of shark related media that just won’t do. But today is Flash Friday, how can I make it also about Shark Week? Warning, this may be the dumbest thing I’ve ever posted. It may also be the greatest. Shark Flash! An innocent mako is swimming though a chemical spill when it is struck by lightning; instead of being instantly killed it is granted super-speed! The shortfin mako is already thought to be the fastest shark. It has been recorded swimming at speeds of 20 miles per hour. The fastest human swimmers haven’t even been able to reach 6 miles per hour. If any shark was going to be the Flash it would have to be the mako. 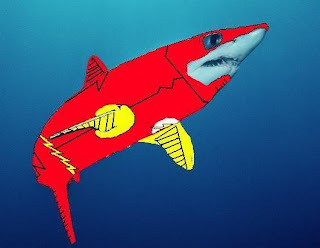 Also, if you prefer your Shark Flash in the new 52 style…. Because I’m sick in the head I started thinking about other members of the Justice League and what shark they’d be. Superman would be the great white. That’s a pretty simple one. I think Batman would be a bull shark. They are ruthless and they’re able to swim into fresh water. Green Lantern would be a smooth lantern shark. I mean lantern is already in the name, it’s an easy one. I’m still thinking about the others. That is some damn good MS Paint work, sir.